While there were many important issues facing the incoming Trump administration in January 2017, the most serious one it faced was this: a network of Obama/Clinton partisans who were already demonstrating a commitment to a strategy of leaking classified information, in order to sabotage the incoming president and his team. Partisans entrenched across the agencies of the federal government spent the entire transition period making it clear that they viewed Trump’s election win as illegitimate and that they fully intended to sandbag him at every opportunity. The new president hadn’t even been inaugurated yet when a politically motivated strategic leak by a highly placed government official of a classified intelligence report placed his national security adviser, Lt. Gen. Michael Flynn, under FBI investigation. Even before that, other leaks by Obama/Hillary partisans inside the DOJ, the FBI, the State Department, and various intelligence agencies had been used to place Trump campaign personnel such as Carter Page under suspicion of being foreign agents of Russia. Just before Trump took office, BuzzFeed published what became known as “the Steele dossier,” an amalgamation of various second- and third-hand accounts supposedly from anonymous Russian informants that placed Page and former Trump campaign chair Paul Manafort under suspicion. If the incoming Trump team had not known before, they certainly learned at this point that countermeasures were going to be needed. If something wasn’t done, Trump would never be able to effectively govern the executive branch. Faced with the daunting challenge of rooting out an entrenched network of determined politically partisan leakers, spread across the breadth of the federal government, Trump and his team put their heads together and came up with a plan. Although some people try to sell a narrative that Trump and his top people have no plan for dealing with the leakers and saboteurs—and that if they do, they’ve been tricked or outmaneuvered by the “deep state”—there is plenty of evidence to the contrary. Attorney General Jeff Sessions called a press conference last year on Aug. 4 to announce the formation of a special FBI unit that would be tasked solely with hunting down leakers of classified information. Since this new unit is a counterintelligence unit, its activities are shrouded in secrecy. 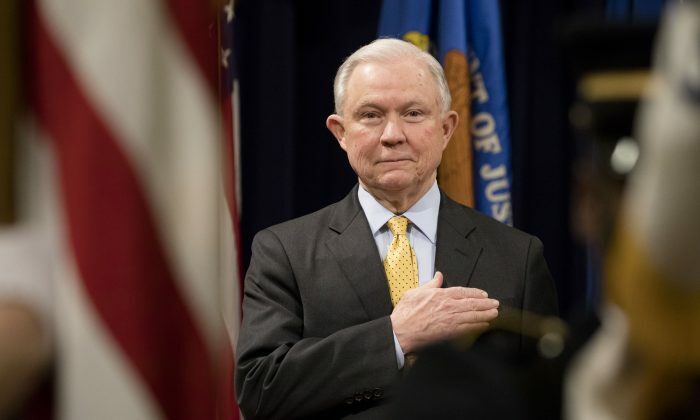 Still, Sessions has pulled the curtain back at several points in the past year to allow a peek, such as when he announced there were 27 ongoing investigations into unauthorized leaks by November 2017. Another thing Sessions has revealed: For the past year, DOJ Inspector General Michael Horowitz has been engaged in a number of leak investigations, something former FBI Deputy Director Andrew McCabe found out the hard way when he was terminated just before he’d have been eligible for his full pension and benefits. And Sessions has also revealed that Horowitz is not working alone on these leak investigations, but rather in tandem with a team of U.S. attorneys led by John Huber. Many people assume that the moment a leaker is identified, that person is yanked out of his or her job. That isn’t how it’s done in the real counterintelligence world. The only way you roll up an entire leaking network is to identify the members one at a time but leave them in place, then feed them canary traps full of leak markers to help identify other members of the network. Let me give you an example of an obvious canary trap with a leak marker that was used last year. CNN reported a story in which Donald Trump Jr. received an email dated Sept. 4 that offered him an encryption key for hacked emails that had not yet been made public by WikiLeaks. CNN said three different sources claimed to have seen this email document, and all three reported the Sept. 4 date. As it so happens, the real email Trump Jr. received was dated Sept. 14. After issuing a belated correction, CNN and many just assumed that somehow three different people made the same mistake. Hardly. A deliberately altered document was shown to suspected leakers—and three of them had just outed themselves to the leak hunters. Only after the leak hunters are positive they’ve successfully identified all members of the leaking network, and which reporters they’ve leaked to, will they go ahead and begin the arrests and the prosecutions. This takes time. The indictment of James Wolfe, the former Senate Intelligence Committee head of security whose job involved the handling of classified documents makes it clear he was first confronted by FBI leak hunters in December. That means he quietly resigned from the job, and then… nothing happened for six months until his being charged was made public this past June. During those six months, despite the fact that multiple reporters were involved in the leak investigation, nothing about it was leaked in the media. The Wolfe indictment hit as a complete surprise. So will the other indictments, when the leak hunters are ready to reveal them. Correction: A previous version of this story had an error on the timing of James Wolfe’s resignation. Wolfe resigned from his job. The Epoch Times regrets the error.